Ceiba is the name of a genus of many species of large trees found in tropical areas, including Mexico, Central America, South America, the Caribbean, West Africa, and Southeast Asia. Some species can grow to 70 m (230 ft) tall or more, with a straight, largely branchless trunk that culminates in a huge, spreading canopy, and buttress roots that can be taller than a grown person. The best-known, and most widely cultivated, species is Kapok, Ceiba pentandra, one of several trees called kapok. Recent botanical opinion incorporates Chorisia within Ceiba, raising the number of species from 10 to 20 or more, and puts the genus as a whole within the family Malvaceae. Ceiba species are used as food plants by the larvae of some Lepidoptera (butterfly and moth) species, including the leaf-miner Bucculatrix ceibae, which feeds exclusively on the genus. The tree figures an important part in the mythologies of pre-Columbian Mesoamerican cultures. For example several Amazonian tribes of eastern Peru believe deities live in Ceiba tree species throughout the jungle. The Maya civilization believed, Yaaxché, a concept of the central world tree is often depicted as a Ceiba trunk, which connects the planes of the Underworld (Xibalba), the terrestrial realm and the skies. The unmistakable thick conical thorns in clusters on the trunk were reproduced by the southern lowland Maya of the Classical Period on cylindrical ceramic burial urns or incense holders. Modern Maya still often respectfully leave the tree standing when harvesting forest timber. The Ceiba tree is represented by a cross and serves as an important architectural motif in the Temple of the Cross Complex at Palenque. Ceiba Tree Park located in San Antón, Ponce, Puerto Rico; its centerpiece is the historic Ceiba de Ponce, a 500 year old Ceiba pentandra tree associated with the founding of the city. In the surroundings of the legendary Ceiba de Ponce, broken pieces of indigenous pottery, shells, and stones were found to confirm the presence of Taino Indians long before the Spaniards that latter settled in the area." In 1525, Spanish Conquistador Hernán Cortés ordered the hanging of Aztec emperor Cuauhtemoc from a Ceiba tree after overtaking his empire. The town of Chiapa de Corzo, Chiapas, Mexico was founded in 1528 by the Spanish around La Pochota, Ceiba pentandra, according to tradition. Founded in 1838, the Puerto Rican town of Ceiba is also named after this tree. The Honduran city of La Ceiba founded in 1877 was named after a particular Ceiba tree that grew down by the old docks. In 1898, the Spanish Army in Cuba surrendered to the United States under a Ceiba, which was named the Santiago Surrender Tree, outside of Santiago de Cuba. Ceiba is also the national tree of Guatemala. The most important Ceiba in Guatemala is known as La Ceiba de Palín Escuintla which is over 400 years old. In Caracas, Venezuela there is a 100 year old ceiba tree in front of the San Francisco Church knownas La Ceiba de San Francisco and is an important element in the history of the city. Ceiba pentandra produces a light and strong fiber (kapok) used throughout history to fill mattresses, pillows, tapestries, and dolls. Kapok has recently been replaced in commercial use by synthetic fibers. 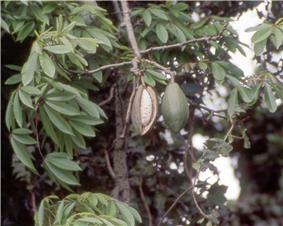 The Ceiba tree seed is used to extract oils used to make soap and fertilizers. The Ceiba is continued to be commercialized in Asia especially in Java, Malaysia, Indonesia, the Philippines. 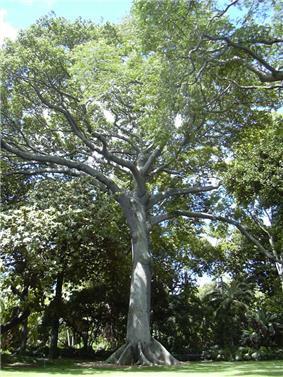 Ceiba pentandra is the central theme in the book titled, The Great Kapok Tree by Lynne Cherry. Ceiba insignis and Ceiba speciosa are added to some versions of the hallucinogenic drink Ayahuasca. 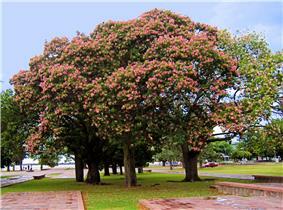 "Ceiba speciosa" at the National Flag Memorial Park in Rosario, Argentina. Ceiba pentandra found in the center plaza of Chiapa de Corzo, Chiapas, Mexico. Buttress roots of a Ceiba tree near the bank of the Amazon close to Iquitos, Peru. ^ Mill."Ceiba". Germplasm Resources Information Network. United States Department of Agriculture. 2003-06-05. Retrieved 2009-10-13. ^ (BBC Earth News) "Sacred plants of the Maya forest", 5 June 2009 accessed 6 June 2009. Pachira aquatica and Pseudobombax ellipticum are also represented in the designs of similar ceramics. ^ En intensivo la venerada Ceiba de Ponce. Jason Rodríguez Grafal. La Perla del Sur. Ponce Puerto Rico. 19 July 2011. Retrieved 20 July 2011. ^ Explore Puerto Rico By Harry S. Pariser. Page 246. ^ "Ceiba"Subordinate Taxa of . TROPICOS. Missouri Botanical Garden. Retrieved 2009-10-13.